We are a law-abiding family. Deception is not in our DNA. May I introduce to you Exhibit A. May I now introduce to you Exhibit B. 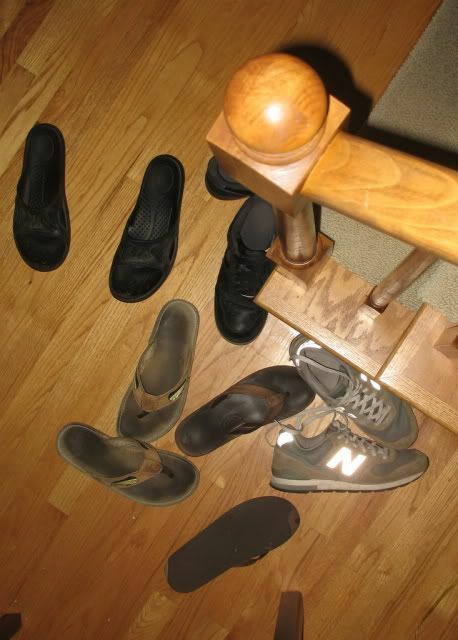 Each of these pair of shoes represents a young man. A young man who joined Nate last night for the 2009 Great Summer Sleep Over. Now let me just say that Nate has had these certain young men over before and I have actually witnessed with my own eyes an entire 9x13 pan of brownies disappear into their yawning caverns of teeth in as few as seven seconds. A one dollar pan of brownie mix? No biggie. A pan of bars that cost me cream cheese AND crescent rolls? Yes biggie. And so here comes the deception part. I do hope you all can still respect me after I share this with you. I am here to hereby admit that Steve, Sarah and I (cream cheese bar lovers, all) put our devious heads together to try to come up with a plan to save the bars from the impending horde of hungry male humans who were about to invade our home. After bringing up several solutions that didn't seem "tough" enough to handle this particular challenge we finally hit upon a winning deception stratagem. 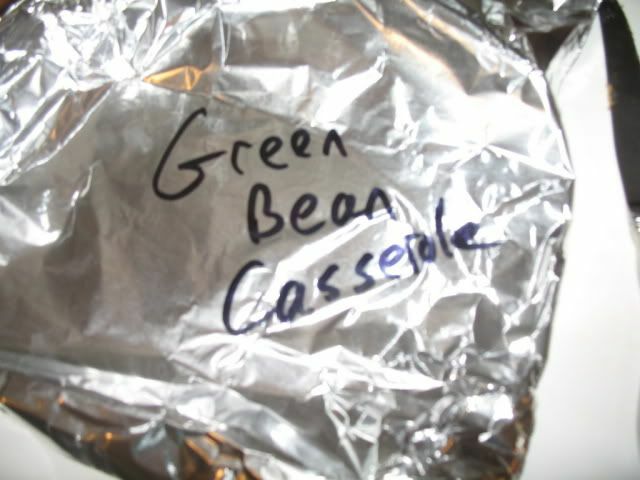 May I introduce Exhibit C.
Yes, I am here to admit that we decided to cover the bars with a piece of foil marked, "Green Bean Casserole." When I got up this morning, the bars were still there. Untouched. Unsullied. Unconsumed. And so you know what I did, don't you? I had a little bite of green bean casserole, just to celebrate. I love me some green bean cassesrole. Recipe please!! You also have a award at my blog!! Come on over!! I love it, and may just try that one day....ha ha ha! Wouldn't work on me, cause I do love green bean casserole, however anything with cream chese must be close to what Manna was! Yum Yum, eat em up! OK deceptive, well maybe, cruel, not really, but BRILLIANT< absolutely!!!!! Thanks for your comment. I do enjoy reading your works of art, my friend. I think I could really get into that kind of green bean casserole! That is too funny, Ms. Becky! Please post the recipe for that special "Green Bean Casserole" sounds like it will be my favorite green bean casserole! My family used to hide goodies in the hall closet in a big suitcase or my brother would inhale them (all). When my best friend would come over we'd put them in the oven because everyone knew he'd never think to look there. 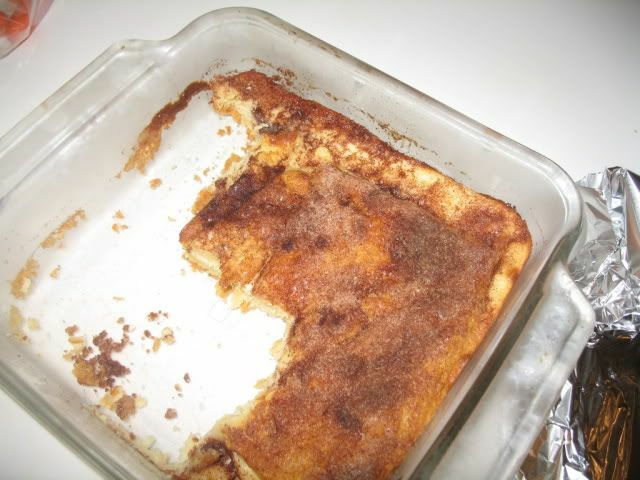 That only was a problem if whatever it was was freshly made and the house smelled like _____ (fill in the blank for anything like brownies that were hard to disguise). Then they wound up in the suitcase, too! ha ha! 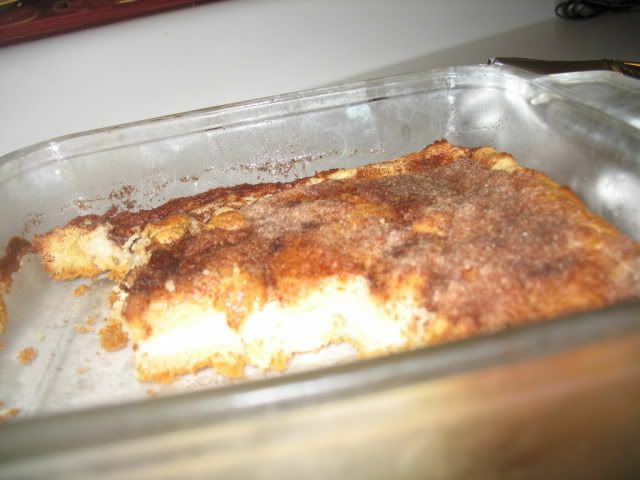 This is my very favorite recipe too! Only make it on holidays, because it doesn't go well with my "low fat" diet... Love the Green Bean Casserole idea... hilarious! I am shocked. Stunned. Almost, but not quite.. horrified. Your son... the product of your loins, the sharer of your DNA, the continuation of the Smith family name.. (because we ALL know how rare THAT name is...). Actually, I'm not. Actually? I'm impressed at your brilliance, and should I ever need a devious plan in the future, YOU will be my go-to gal.